I’ve been pretty quiet lately but that’s purely down to my current workload (my proper job). That’s not to say I haven’t been busy in my spare time and you should expect a flurry of releases in the near term. 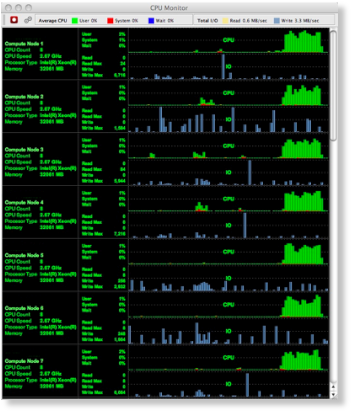 The first of these is a simply utility that I put together for some benchmarks I’ve been doing, its called “CPU Monitor”. I know not an original title.... but it pretty much describes what its designed to do. I also know there are plenty of tools like these on the market but I wanted something that was trivial to set up and configure and could look at lots of machines at the same time. I intend to extend it in a number of directions. Its primary aim is to support monitoring clusters of machines (I’ve been working on Exadata pretty much exclusively for the last 6 months) in near real time and record the stats for later analysis. Support for Solaris, and AIX. You can find it here . Let me know if you find it useful. I’ve uploaded a new build of swingbench 422 to the website, I’d recommend upgrading to this build its pretty stable and includes a lot of bug fixes. 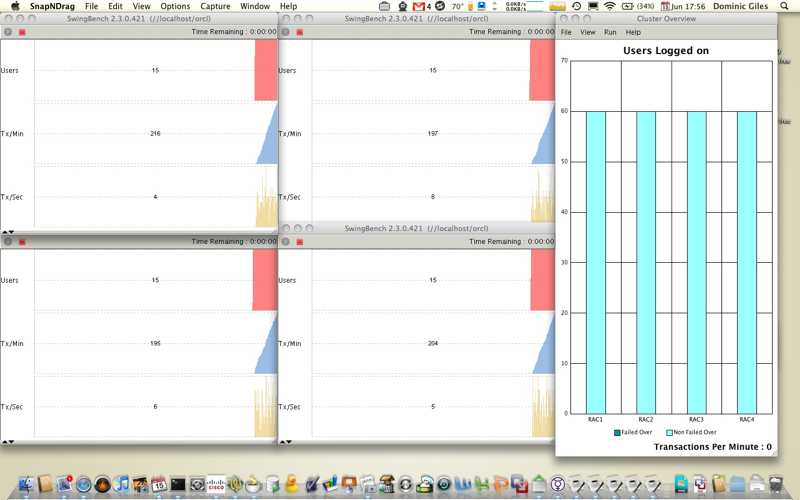 It includes some new functionality relating to specifying window sizes and positions for minibench and clusteroverview. This means its now possible to maximise the real estate used by swingbench without having to move things around after you’ve started it up. The following example illustrates what’s possible. Hope you find this useful. I intend to shortly publish a new webcast on how to set up and use clusteroverview. I’ve uploaded a datagenerator screen cast here that explains its functionality and provides a quick walkthrough. Let me know if its useful. I’ve just uploaded a new screen cast on defining your own transactions, I get asked a lot of questions about it. I’ve also updated the website to enable me to do more of them quicker. I enjoy doing them I hope they help you. Ok... So if your not interested in Java ignore what follows. I can then loop around capturing the output and parsing it. Simple.... This approach works on Linux, Mac OS, HP-UX, AIX and Solaris however it fails under Windows. It sits there and simply waits. Now this appears to be a common problem based on the number of postings on it. This article suggests a number of approaches to solve the problem. I’ve tried them all and the good news is that they appear to work for a single atomic call that returns all of its output then exits. However commands such as “vmstat/iostat/sar” etc. return output periodically based on their refresh rates and don’t seem to work at all. There are plenty of hits in google but no one really seems to suggest a solution. Now Im sure this worked in the past and Im almost certain that I haven’t changed the code. java myexec cmd /c "c:\\cygwin\\bin\\ls.exe"
Which returns the first line of the directory and then exits. Works fine.... So my believe its the combination of java and cygwin and the way io is redirected. If anyone has a chance to look at it.... I’ll be very grateful. Code for simple testcase below. Sorry for the delay... My DSL router has been bust for the last week and so Im behind in everything. So first things first.... Happy new year. Thirdly stick with me over the coming months I’ve got a big workload (my proper job) on at present and Im going to have to squeeze everything else in when I can. So this means delays in bug fixes and doc. Sorry.